Prep surfaces in one step for less with PerfectPrimer. What makes PerfectPrimer the best choice? With PerfectPrimer, you can do what previously seemed impossible or impractical. PerfectPrimer will help make your work easier. PerfectPrimer, buy a single product and for a variety of surfaces. Green: PerfectPrimer is non-toxic. Keep your construction green with this environmentally friendly product. Proven Product: Buy a product you can trust. 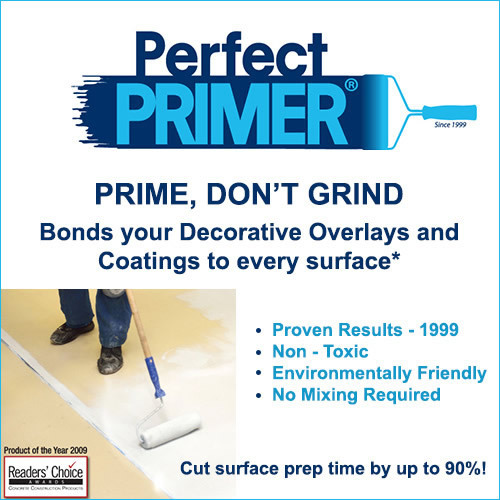 PerfectPrimer has been at the forefront of the industry since 1999. Ready to use: You don’t have to be a pro to get great results. PerfectPrimer comes ready for application. No mixing is required. Tint and apply. Versatile: PerfectPrimer can be used with a variety of products including urethane, epoxies, and acrylic. Easy Application and Removal: PerfectPrimer can be easily applied by brush, spray or roller. If you mess up, clean it up easily with water. No need to grind surfaces with lead or asbestos. Completely encapsulate silica dust, asbestos and lead surfaces for improved safety. PerfectPrimer is an affordable surface sealing/priming solution. Cut Surface prep time by up to 90%!